Origami has a language. Its base consists of some symbols and base forms. 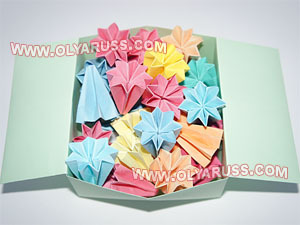 If you can remember them, you’ll start to create a lot of beautiful projects with paper. It means that most of origami models go one after another. This video lesson tells how to make a box. This handcraft is exactly created from one of the base forms. It is called “a double square”. 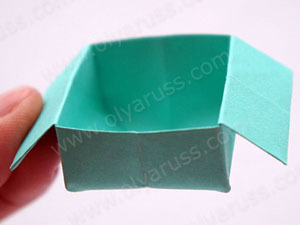 A readymade box can be used as a container for keeping or storing different and useful things. If you want to do the box, prepare one square piece of paper. The paper’s color may be different: white, blue, green, orange and, of course, choose the size yourself. The box’s size depends on its usage. Use the video description below this text to create this handcraft. Origami offers a lot of different boxes. They may be with a cover or without it. The next video lesson shows how to get a universal thing from an interesting paper cube. Новые КОММЕНТАРИИ к урокам отключены. © 2009-2019. www.olyaruss.com. Все права защищены.